Who is the "Best of" the Ellsworth Area? The Ellsworth Area Chamber of Commerce is asking the public to recognize the best that our business community has to offer. The 2018 ‘Best of’ Awards kicks off today with voting taking place on our website here. The ‘Best of’ Awards program is unique because these awards will be based on community feedback. This is a great way to recognize those within our membership who work so hard to go above and beyond for our community, acknowledging them based on what our area residents find most valuable. Each member of the Ellsworth Area Chamber of Commerce qualifies for the ‘Best of’ Awards. This year's voting takes place in seven categories: Best New Business, Best Restaurant/Bar/Tavern, Best Tourism Destination/Attraction, Best Health & Wellness, Best Professional Home Services, Best Professional Services and Best Customer Service. Voting will commence in two rounds. First, the community is asked to narrow down the field in each of the six categories. The three nominees in each category who receive the most online votes will advance to the final round, at which time the community will once again vote to determine the final winners. The awards will be presented at the chamber’s Annual Dinner, which will take place at Kilkarney Hills on Monday, February 19. 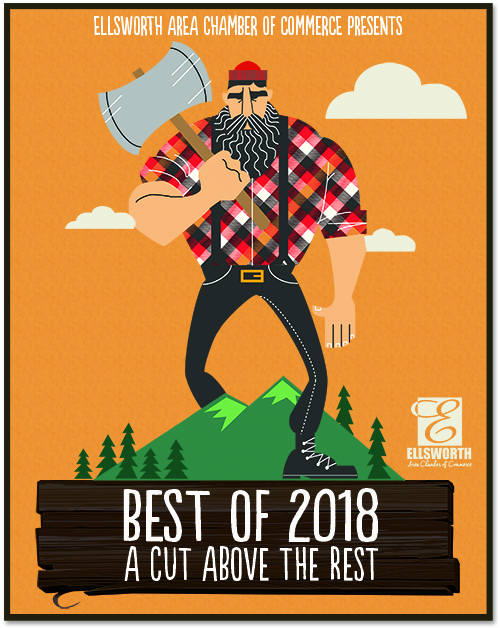 Winners will receive a commemorative poster for display at their business and have bragging rights until the 2019 ‘Best of’ voting takes place next year. The first round of voting concludes at midnight on Monday, January 29. The finalists will then advance to the next round of voting, which will take place from Thursday, February 1 through Saturday, February 10. You'll find the official rules and can cast your votes, here. Additional announcements and news about the competition will be made available on our Facebook page. Thank you for helping us acknowledge the best of our local business community!